Former Buyende DPC Mohammad Kirumira arrives at Naguru police headquarters where hs is standing trial for charges related to misconduct. Former Buyende District Police Commander Mohammad Kirumira is today appearing before the police disciplinary court. 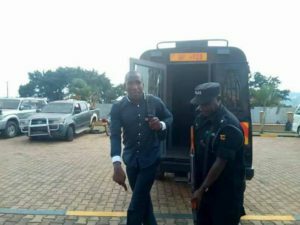 Kirumira was arrested on Thursday last week by the police Flying Squad and charged with scandalous conduct, extortion, corruption and unlawful exercise of authority. 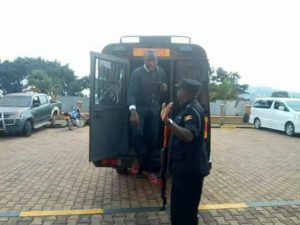 As the mobile police detention van in which Kirumira was transported arrived at Naguru police headquarters, the maverick police officer spoke to journalists, saying the charges against him were trumped up and could not hold. “When someone is accused, the accuser records a statement at police. Where are the statements that these accusers recorded,” Mr Kirumira asked. This is the second hearing that the court is holding to try Kirumira. On February 2, Kirumira appeared before the same court and was prosecuted by Ms Katherine Kusemereirwa, who presented a witness Atuhaire Steven, alias Kalefu Sunday Robert, accusing Kirumira of extorting Shs150,000 sometime in 2013. However, Kirumira declined to cross examine the witness claiming that he was a ghost witness. Ms Kusemereirwa then asked court to detain Mr Kirumira, arguing that setting him free would lead to him tampering with witnesses. She argues then that many witnesses have expressed fear to appear before the court arguing that Kirumira mistreated and tortured them.